the Columbia Philharmonic Orchestra. 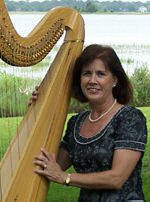 Judy received her Bachelor of Music degree from the University of South Carolina, majoring in harp performance. She is the former principal harpist for the Columbia Philharmonic Orchestra, the Greenville Symphony, and the Brevard Symphony. She has also performed as harpist in numerous orchestras in South Carolina and North Carolina. Judy has extensive experience in providing harp music for a variety of occasions, including weddings, receptions, parties, dinners, corporate events, and church programs. Her repertoire includes classical, popular, religious and traditional harp music.